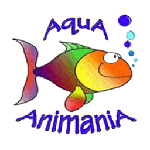 AquA AnimaniA is your #1 local source in Windsor, Essex County and Beyond, for aquarium tanks for freshwater, tropical, saltwater and reef aquariums of all shapes and sizes! Fish tanks are mainly made of glass, but acrylic is sometimes used as well. The size of the tank you need will depend on the type and number of fish that you plan to have. 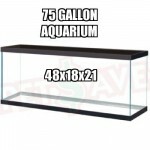 Below we have included a few select aquarium tanks and general product information. Be sure to inquire, or visit our store in person, to see the complete aquarium tank selection we have available, in-stock. We can also special order unique items and other products from our vast network of national and international partners and suppliers. 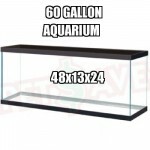 When determining the size of tank required, a general rule is to allow one gallon of water for each one inch of fish. This equates to about one centimetre for each litre of water. For example 20 neons would be manageable in a 20 gallon tank. With a well balanced aquarium and a proper filter, you will be able to exceed these limits. One of the main factors in supporting fish is the surface area of the water. 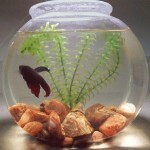 Please note that fish bowls are only suitable for Bettas and Tetras. Goldfish shouldn’t be placed in small fish bowls, because they need more oxygen and are messier than most fish. A typical fish bowl is usually smaller at the top and reduces the exposure to oxygen. Since bettas can breathe air directly, this isn’t an issue for them. 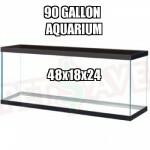 We provide friendly, expert advise and tips plus carry a full line of aquariums, aquarium kits, aquarium heaters, aquarium pumps including an endless selection of aquarium supplies, aquarium accessories and much more! Trust AquA AnimaniA for the highest quality and healthiest live aquarium plants, live marine coral, saltwater marine fish and freshwater tropical fish species in the industry. We also stock a wide variety of healthy and nutritious fish foods and live foods along with an endless selection of fish supplies. AquA AnimaniA also carries thousands of products for outdoor garden ponds along with various species of healthy pond fish and pets plus countless pet supplies and a whole lot more!